With national buzz surrounding apprenticeships as a way to prepare students and career-seekers for a 21st century workforce, Charlotte Works, the City of Charlotte’s Mayor’s Youth Employment Program (MYEP), MeckEd and ResCare Workforce Services partnered with Charlotte Area Transit System (CATS) to recruit and train participants for its diesel auto-mechanics apprenticeship. This initiative extends the pre-apprenticeship program created in 2015. Charlotte Works announces #Careers4All community campaign that lays out strategies targeting those left out of Charlotte’s major economic development and infrastructure projects. Focusing on unemployed and under-employed residents, Charlotte Works will invest $4.2 million in workforce development during the 2017 program year and expand availability of training scholarships to moderate-income families in Mecklenburg County. Charlotte Works’ career centers, in partnership with N.C. Department of Commerce’s Veterans Services, will host its biannual Veterans, Family and Friends job fair on Tuesday, Nov. 7, from 9 a.m. to noon at Goodwill Industries of the Southern Piedmont’s Opportunity Campus located at 5301 Wilkinson Blvd. The hiring event is open to the public, but it will feature a special hour exclusively for veterans and family. 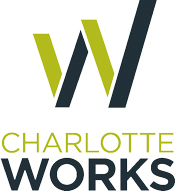 Charlotte Works was awarded $531,000 through the state’s career pathway and innovation grant programs to implement regional and statewide pathway models. The grant will also be used to coordinate a soft-skills and retention-focused curriculum for workforce partners and the state’s community college system. The combination of new grants will enhance local and statewide talent development for employers and provide greater career and skills exposure for the K-12 education system. We want to make it easy for you to use our brand in the right way. Our brand guidelines are a quick way to help you do it. Download our logos for print, web and more. Review our brand guidelines for proper usage. By using the resources on this site, you agree to follow our brand guidelines.